Part 3 of 3 of the Triple Crown! It had been nearly three months since running a race, and given the leg pain from May that has not yet gone away, I had been fearing this race for months. I kept up about 75% of the training, but in the last few weeks before this race, I took a lot of time "off" in hopes that some rest would help. I'm still not sure if it did. If I have one thing to say about the coordination of this race, I'd say Neil Finn did an excellent job with logistics, besides the fact that the Expo was near the airport, and everyone picking up their packet had to endure that ridiculous airport traffic. This race commenced at the Cabrillo National Monument in San Diego. I was staying at the end of the race, so a bus took us to the start. With such an early start time, I was hoping it would not warm up very quickly, but alas, it did. That's humid August weather for ya'. The first few miles had a weird stench in the air. I ran the first two miles pretty conservatively at around 9 min/mi, given that I am one of those people who dashes the first few miles in every race. Around the third mile or so, after a few uphills, was a steep downhill mile that I ran in 7:40. I caught up to my sister and was running behind her for a while. I figured I would keep her in sight as long as I could so I would not let my tightening shins slow me down too much had I "run by feel." Just as a slight uphill began sometime around the fourth mile, seemingly all the muscles in both my legs seized up, leaving me unable to "clear" the uphill, leading me to eat the dirt... or asphalt. It was a brief and extremely embarrassing moment that I quickly rose from and dashed off. A woman and some guys dashed ahead to ask if I was okay, that I should stop at the next aid station. I told them I was okay, and they clapped a bit for me and started making comments about "speed bumps" and "battle scars." Knowing I still had nine miles to go, I let up on my pace so my legs would not give me anymore trouble. I saw I had run four miles in less than 32 minutes and was a bit frustrated that I was going. Then the heat came in during the next two miles, and I did not get a chance to get water or wash off my wounds until the sixth mile before the 10K point. I finished the 10K below 58 minutes, which is actually about average for me. The second part of the race was flat and boring, going through the Terminal lanes of the San Diego Airport. I found it very hard to keep going at a decent pace because at this point, I felt overheated, and there was no water to be found for a few miles. I basically ran the remaining part of the race at a very slow pace, stopping at every water station. Mile 11.5 to pretty much the end was uphill, some parts worse than others. For some reason, I found the uphills in the beginning to be worse, perhaps because I was hitting them at a faster pace. My watch said 13.1 miles, but I could not see the finish line until about a quarter of a mile later. I managed to sprint the last 200 meters or so, my goal at that point to come in below 2:12, which was my time for Carlsbad when I also ran on a bad leg. 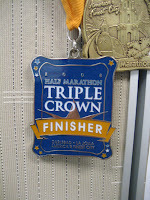 The medal was nice (photo credit to Tea Time), and I was finally awarded the Triple Crown medal!! I always feel disappointed in myself after races, but I really should not complain. I ran a 2:10 in La Jolla, and a 2:12 in Carlsbad, so this one kind of fell in between those two. And since I was conservative in running this race, I don't think I caused anymore injury to my shin and will thus be able to continue my training relatively uninterrupted. Hopefully my condition will improve as I start to increase my mileage for marathon training. I sometimes wonder if my times have more to do with weather than injury. When I PRed the last time I raced, my leg was only slightly better, but I ran like 15 minutes faster because of cooler weather. This was my tenth half-marathon (131 miles) since I started racing in 2006... and tenth race in 2008 alone. Given that experience, I should not have had such a hard time. Finally, I would like to say that the weekend was fun staying/eating out in San Diego with my sisters and friends. Also, props to my sister for running a 1:56, and to the boyfriend for running a 1:44. Besides using Aquaphor for chafing, I've found three other things this stuff can be used for, which is a good thing, since I have a few sample sized ones and a large bottle at home. 1) Removes eye makeup - If you're wearing something else that is hard to rub off before running (primer makes it darn difficult/impossible), a little bit of Aquaphor makes it come right off. 2) Moisturizes lips - When I forget my chapstick and don't want to be running with dry lips, this scentless stuff does the trick. 3) Helps dry knees - Often, my knee gets incredibly dry at this one small spot. If I have the Aquaphor out for one of the other uses, I usually remember to use it for this purpose. There you have it! 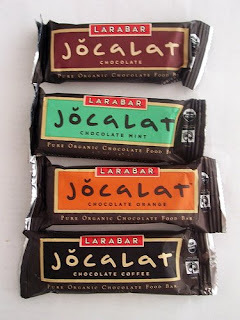 So next time you get a little sample of this stuff in your running goodie bags, know that it will come to good use! !